According to a top-secret accounting dated Jan. 9, 2013, the NSA's acquisitions directorate sends millions of records every day from internal Yahoo and Google networks to data warehouses at the agency's headquarters at Fort Meade, Md. In the preceding 30 days, the report said, field collectors had processed and sent back 181,280,466 new records — including "metadata," which would indicate who sent or received e-mails and when, as well as content such as text, audio and video. 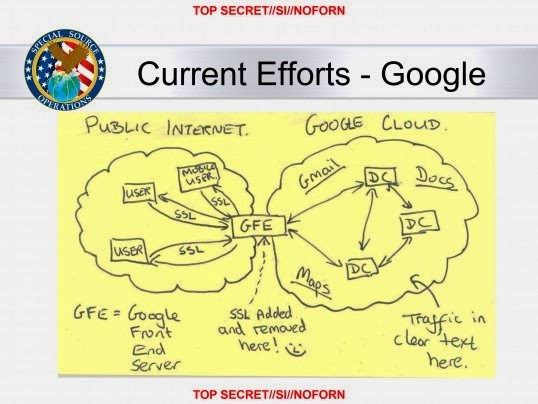 Inabove slide from a National Security Agency presentation on "Google Cloud Exploitation," a sketch shows where the "Public Internet" meets the internal "Google Cloud" where user data resides. Two engineers with close ties to Google exploded in profanity when they saw the drawing.